Reel Mowers: Your Lawn Will Love You For Using It. If you are an environmentally friendly homeowner-and your lawn's not too large-than you should consider mowing your lawn with a reel mower instead of a gas powered lawnmower. True, it will mean more frequent cutting, but it will also eliminate trips to the gas station with a smelly gas tank and a reel mower will be gentler for your grass. The following article discusses the benefits of cutting your grass with a reel mower. Using a reel mower instead of a gasoline or electric mower means that you can no longer wake up your neighbors early on a Saturday morning to the sound of that unmistakable racket or bathe their windows with those somewhat toxic fumes. Of course, if you are on friendly terms with your neighbors than you won't miss that clatter or the smell produced by the gasoline mower. You may also be able to hold a conversation with your neighbor while you mow with your reel mower. The real benefit of a reel mower is for your lawn as well as the environment. A rotary mower will bruise and even tear your grass blades, but a reel mower provides a clean cut that is better for the health and look of your lawn. Also, because these mowers are simple to maintain-just have their blades sharpened every other year-they are much more inexpensive than other mowers and will not break down because they have no complicate parts as do the gasoline mowers. Another advantage of the reel mower is that it will prompt you to exercise more frequently! Well, this may not be to every homeowner's liking, but reel mowers cut a narrower strip of grass than other mowers so you'll need to make more trips up and down your lawn. Also, reel mowers work best on grass that is not too long which means for the best overall effect-you have to mow more often. And don't forget, being friendly to the environment is not just trendy these days-it is truly important; but then, most garden-lovers know that! 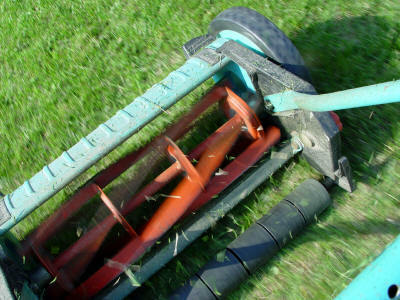 Reel mowers can be frequently found at yard sales. But newer models are often built very user-friendly and are lightweight to push. If you enjoy your lawn and like to be outdoors than a reel mower is an essential tool for your landscape.